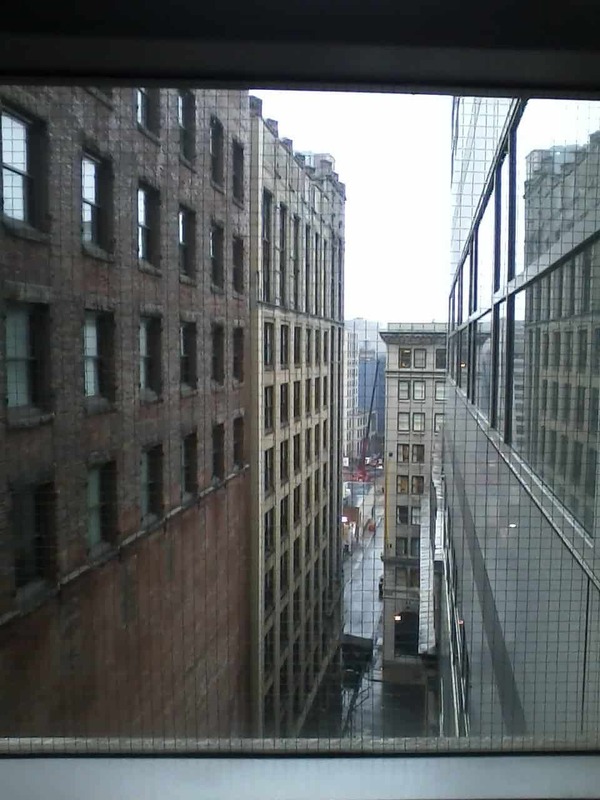 Photo taken from the 6th floor of one of the main academic buildings at Emerson’s Boston campus. “If you’re torn between dentistry, dermatology and acting, don’t come here,” said an Emerson senior on a student panel before a few dozen college counselors. The best way to sum up the kind of student who comes to Emerson College: storytellers focused on their craft. Whether they major in communications, journalism, visual or performing arts, Emerson students don’t come here to “find themselves.” They know that arts and communication, in its many forms, are their calling, and they come to Emerson to develop a liberal arts context and pursue those storytelling dreams. With an acceptance rate of about 48% and a new facility in Los Angeles, Emerson is set to rival other west-coast based performing and visual arts schools in their own backyard. They offer both BA and BFA (Bachelor of Fine Arts) degrees, and BFA programs have a capstone or thesis requirement. Emerson is an urban campus in the middle of Boston (literally across the street from the Boston Common); its academic buildings are filled with production studios and equipment check-out facilities. Students can take classes at several other arts-related colleges in the Boston area, with credits transferring automatically. Students broadcast 2 news shows daily and Emerson was one of five schools selected to report from the Beijing Olympics and the only school reporting from the Academy Awards. Entrance to the visual and performing arts majors requires a portfolio or an essay (the portal is here), and Emerson is looking for students who have collaborative, team-focused experience as they prepare for their production-related careers. The BFA Musical Theatre program is exceedingly competitive – nearly 900 applicants vie for 17 spots, equally split between men and women. Emerson will waive the math requirement for students who earn a score of 550 on the SAT Math section or 24 on the ACT Math section, and will waive the foreign language requirement for students who pass three years of foreign language during high school. 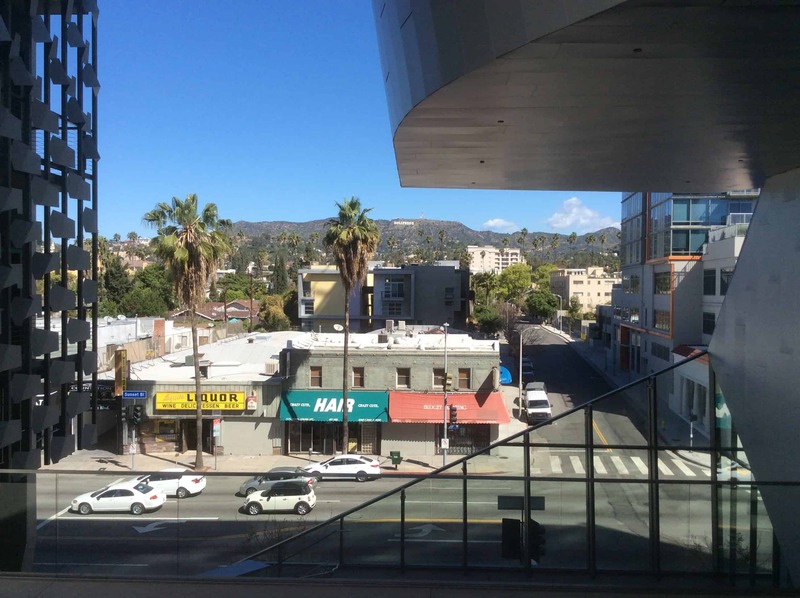 View of the Hollywood Sign (to the right of the middle palm tree) from Emerson’s LA campus. Emerson also has some interesting majors that are not specifically related to performance or production, including political communication and communication disorders. About 200 students – mostly in the film and TV production tracks – spend a semester “abroad” at Emerson’s Hollywood/Los Angeles campus, which is a spectacular building on Sunset Blvd. These students do intense, substantive internships that Emerson helps them find, and take a few classes during this semester as well. Many students do this semester abroad during their final semester of college, so they can transition easily into full-time work after their internships. Evelyn visited Emerson’s Boston campus on a rainy spring day in 2012, so we didn’t get too many photos – but the ones we took are here! Debbie and Evelyn toured Emerson’s Los Angeles campus in March, 2016 – you can see the photos from that campus here. The photo in the header of this page is the sign on the front of Emerson’s Los Angeles campus on Sunset Blvd.